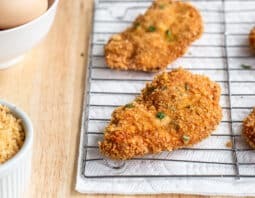 Panko breadcrumbs are the perfect thing to coat chicken with for frying because they crisp up so beautifully without adding too much bready flavoring. A simple egg wash binds it all together for the crispiest fried chicken ever. Panko breadcrumbs are Japanese style breadcrumbs that are really just made from bread without crust. That’s why they’re so light and airy – it’s all the inside goodness of bread, with none of the dry crust included in the crumb. It’s popular to use in place of breadcrumbs when frying food because of the texture it gets when it hits the oil and has a chance to crisp up. Because panko is so light and airy, it gets a ridiculous amount of crunch which is the key to all good fried food. We happen to think that Panko Fried Chicken is one of the best variations of fried chicken out there. All it takes is a simple egg wash to coat the chicken and bind the breadcrumbs to it. Once the oil is hot, you let it bubble until the panko is a deep golden color and the chicken is cooked through. Are you ready for this juicy, crispy, fried bite of heaven? 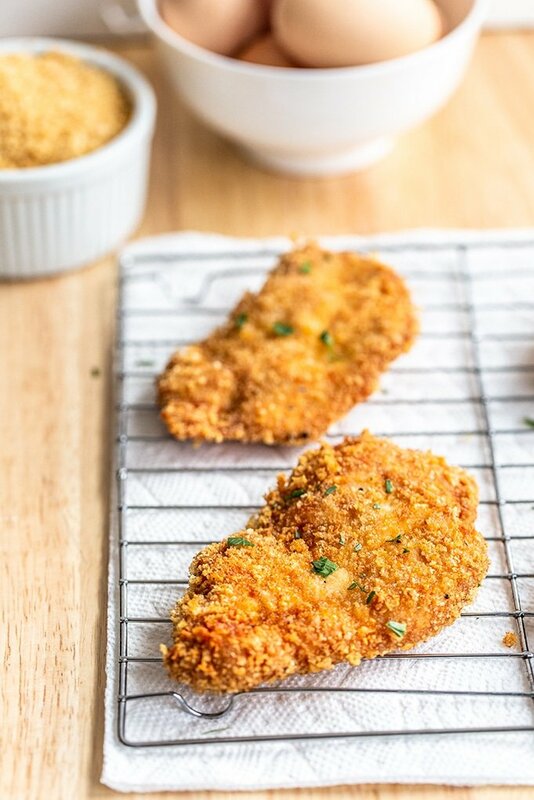 Panko breadcrumbs are the perfect thing to coat chicken in for frying because they crisp up so beautifully without adding too much bready flavoring. A simple egg wash binds it all together for the crispiest fried chicken ever. Heat the oil over medium heat in a large skillet or a stock pot to 300°F. Use a thermometer like this one to keep your oil at the right temperature. Meanwhile, butterfly the chicken breasts by slicing them in half lengthwise. In a medium-sized bowl, mix together the panko, salt, garlic powder, paprika and pepper. Crack the egg into a small bowl and beat it until it’s an even color. Dip each piece of chicken in the egg and allow any excess to drain off back into the bowl. Then dip the chicken in the panko mixture, covering completely. Repeat until all the chicken is coated. When the oil is hot, add a few pieces of the chicken to the pan, being sure to not crowd them. They shouldn’t touch. Fry for about 4-5 minutes per side, or until the chicken is golden brown and the internal temperature reaches 165°F on an instant-read thermometer. Transfer the cooked chicken to a wire rack with a paper towel underneath to drain the oil. Serve while warm.